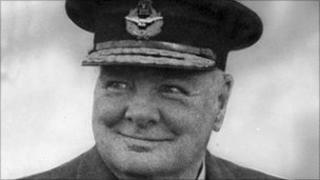 A partial set of false teeth made for Sir Winston Churchill has been sold for £15,200 at an auction in Norfolk. The dentures, sold by Keys in Aylsham, had been expected to fetch a maximum of £5,000 at the sale on 29 July. The teeth were owned by the son of dental technician Derek Cudlipp who made them, but he decided to sell. They were specially constructed to preserve Churchill's natural lisp and were so important he carried two with him at all times. Keys' valuer Andrew Bullock said the wartime premier suffered from terrible teeth and gums and needed complicated dentistry from childhood. Churchill valued so highly the skill of his dentist, Wilfred Fish, who worked with Mr Cudlipp, that he nominated him for a knighthood. And Mr Cudlipp's son, Nigel, said his father's work was so important to Churchill the World War II prime minister would not let him join up to fight. "When my father's call up papers came, Churchill personally tore them up," he said. "Churchill said that he would be more important to the war effort if he stayed in London to repair his dentures." The delicacy and special design of the teeth were widely credited with helping Churchill speak clearly and effectively, said Mr Bullock. The false teeth were bought by a private collector from Gloucestershire. The collector is believed to own a number of items of Churchill memorabilia, including the microphone he used when announcing the end of the war.